Past workshop client? Booking more than one workshop? Email us or call 604.558.2002 to find out if you're already eligible for savings via the Bike Friendly Business Certification. Bike to Work Week has become an exciting biannual event that brings out cyclists of all levels and abilities. Employees rally their colleagues to register for a week of riding to work, and many more rally to come up with creative ways to help one another to feel more confident on a bike. If you have ever ridden a bike then you know how fun it can be. But why exactly is it becoming so popular to ride to work? The byproducts of increased happiness and wellness that are experienced by commuter cyclists of all levels and abilities are representative of a larger trend that is occurring; a movement towards greater wellbeing. The popularity of lifestyle management programs are growing: yoga and meditation programs; tracking physical activity via Fitbit; and free government sponsored workplace wellness programs such as Wellness Fits, are just a few of the solutions people and workplaces are seeking on their path to better health. Public discourse surrounding health and wellbeing is also accompanied by an increased awareness of mental health, stigmatization and public acknowledgement of the importance in paying closer attention to our mental health. Bell Talks, a campaign to erase the stigma of mental health issues and bring awareness of mental health impacts cites, “mental health is the leading cause of workplace disability in Canada and represents 15% of Canada’s burden of disease”. The Canadian Mental Health Association, an organizational member of HUB, points to many factors that can affect the mental health of an individual. The organization’s website emphasizes the importance of balance within one’s life and explains how stress serves as a valuable indicator of a persons overall wellbeing and mental health.- this is referred to as your stress index. Interestingly the Globe and Mail echoed that research with a survey that came out at the end of 2014 which reported similar results (although presented in an easy to scan infographic). With stats like this, it’s no surprise that the Conference Board of Canada will be holding their annual Better Workplace Conference, titled: Making a Difference Through Transformation to include a major focus on the physical and mental health of employees. When it comes to a corporate contribution to lifestyle management, supporting greater physical activity among staff can be the most cost effective investment and plausible return on investment to achieve not only a reduction in employee absenteeism, but a rise in what SHRM refers to as the Employee Positivity Factor – a new frontier in research that measures the positive benefits of happy and engaged employees. Becoming a certified Bike Friendly Business, offered by HUB Cycling in Metro Vancouver, can lead to benefits for both employee health and workplace culture. Optimizing cycling facilities and employee engagement has shown to lead to more employees biking to work, which in turn increases the number of happy, healthy and productive employees showing up to work each day. Spacekraft Coworking houses a number of different businesses and sees the value of offering a wide range of employee wellness programs. "At Spacekraft Coworking, we believe in living a balanced lifestyle and part of that is health and fitness, so encouraging our members and staff to bike to work is a no-brainer. It also means that a group of cyclists are starting to form here, which is great for our community”, explains Spacekraft’s General Manager, Geoff Scoates. 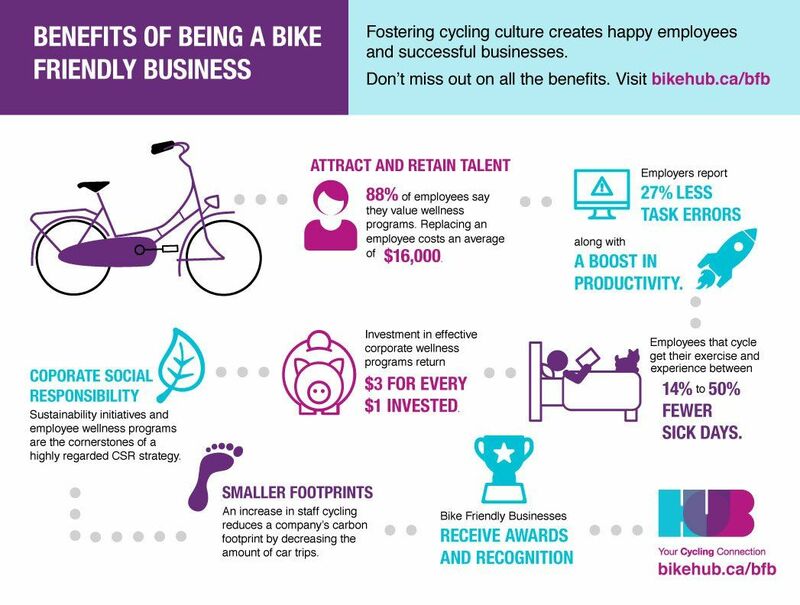 Happier employees are the business of every HR professional - ensuring that staff can arrive to work by bike and enjoy excellent amenities and services is a small contribution that can lead to a big impact. What do New Year's Resolutions and Bike Commuters have in Common? A new year is inspirational. It is a time for reflection, checking in, setting new goals and an opportunity to make 2016 a year to look back on proudly. You can bet that personal fitness tops the list of resolutions yet again, along with saving money, getting more enjoyment out of life and attaining an overall happier lifestyle, according to Time magazine. It may be of no surprise that these goals sound like the same reasons that Bike to Work Week participants say they love to take on the challenge of biking to work. Getting fit and having fun doing it is taking off. HUB Cycling, Metro Vancouver's largest cycling advocacy and action organization is rapidly growing in membership and is proud to see a wide diversity of organizations and individuals champion HUB's mission to get more people biking more often. Smart employers can seize this opportunity and get behind their employee’s health goals by simply taking advantage of the popularity of urban cycling. Commuter cycling is the fastest growing mode of transportation in Metro Vancouver. Many communities are making a number of improvements to cycling infrastructure in 2016 and that of course means even more commuter cyclists on the streets. For us at HUB, we have seen Bike to Work Week participation numbers nearly double each year. With infrastructure improvements like separated bike lanes and increased pedestrian/cycling controlled lights, we expect numbers to rise dramatically in the coming years. Whether an employee is a casual or committed commuter, the workplace destination plays a critical role in the decision of an employee to bike to work. We have seen a lot of great cycling facilities for employees and we can ensure you that this makes all the difference to the cyclist and fitness enthusiast that makes the decides to ride. You wake up and get the kids ready for school. It is a Tuesday and it’s your partners turn to take the kids to school, which is great because this is your chance to hop on your bike and travel the 10 km to work. This will get you there in about 40 minutes, a perfect distance to get your heart rate up and cross off the one of three doctor recommended cardio sessions that you should fit in each week. You pack your pannier bags, throw on your rain proof jacket and out the door you go. If it’s raining (as it often it does in Vancouver) you arrive to work to hang your gear on hooks to dry and are impressed with the new lockers available to store your panniers and other wet gear that you don’t want to drag through the office. You are grateful for the dry and secure place to park your bike and feel good about leaving it behind. Being able to catch a shower after a particularly impressive downpour was helpful and you feel energized and on top of your game for the meeting you have this afternoon. Now imagine the inconvenience if those things are not there. You may reconsider the option to cycle as it does not feel appropriate for the workplace, regardless of how much you enjoy it or want to find the time to fit in that cardio workout. Luckily, bike friendly employers are growing in Metro Vancouver and there are many facilities to be inspired from. HSBC has great parking with ample room, repair space and racks. The Vancouver General Hospital has the Cycling Centre (to the right) with plenty of room for its many busy workers, also equipped with shower and change rooms to accommodate long distance riders. Spacekraft is a new coworking space locatted on Kingsway and Willingdon in Burnaby (just off the BC Parkway), offering secure bike cages for locking and two showers and change rooms. 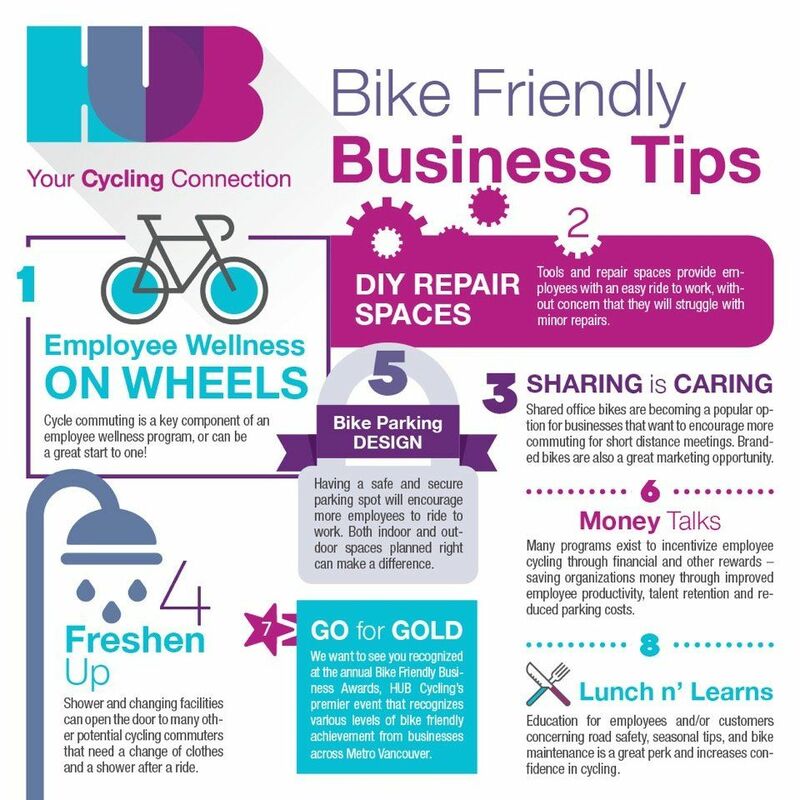 This year at HUB we are making a commitment to support all employers to be bike friendly. 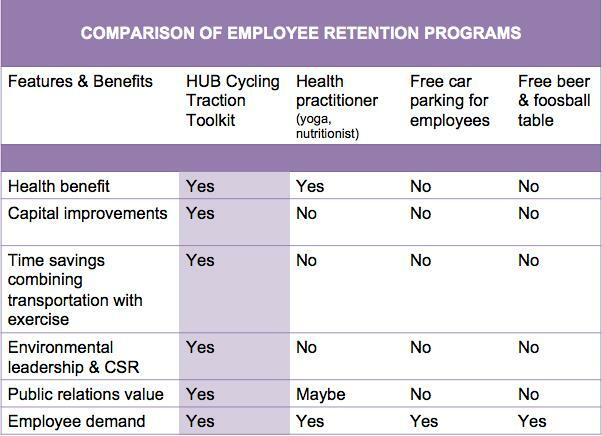 With HUB’s Bike Friendly Business Certification, we are helping employers roll with the health and happiness of their employees! If you care about your corporate culture and love the hype of Bike to Work Week, we have just what you need to get started. The certification will assess, engage, activate and award your workplace, giving your employees confidence and support to ride to work. This past May over 10,000 workers across Metro Vancouver dedicated a week of their life to bike to work and registered their rides with HUB Cycling’s Bike to Work Week online platform. While such pledges are usually reserved for charity events to raise money or awareness about an illness or issue that needs public concern and support, Bike to Work Week is a unique commitment that workplaces across the region, in fact the entire province, are involved in. Each person makes a commitment to bike to work for themselves and in solidarity with their colleagues, as an action to improve their own lives and to bring camaraderie and fun into the workplace. As demonstrated by the successful event and recent cycling counts in Vancouver, BC, commuter cycling has grown in popularity as not only a mode of transportation, but as a means to access the healthy and active lifestyles that promote overall wellbeing and longer, healthier lives. With growing instances of stress related health issues, the pressure is real to eat well, exercise and be your ‘best you’, as Oprah likes to say. Ironically, that same pressure can often cause even more stress on an individual as there are simply not enough hours in the day to exercise, work and take care of the kids’ homework. Not being able to fit in that workout, or feeling guilty because you know you should be trying to burn those calories from last weekends wedding festivities, is part of a vicious cycle – pardon the pun. Biking to work is a welcome option for many “time poor” workers that may be feeling the crunch of doing better for themselves while juggling the increasing demands of family and work. As HUB has learned from its event participants - it is also a great time for cycling curious folks to succumb to some gentle peer pressure and and give it a try! What competitive employers and human resource teams already know is that having a comprehensive wellness program is a strategic advantage to lowering employee turnover rates. The Harvard Business Review crunched the data and found a definite ROI ($2.71 for every dollar spent) from company wellness programs that results from higher retention rates and the increased productivity of their employees. The article notes that programs that are typically accessible and convenient to employees are often found to be the most successful, along with several other characteristics. Electronics Art is one example of a top employer excelling at offering the perk of wellness programs. The company provides an on-site for its employees, making sure that they have access to everything from personal trainers to registered massage therapists. This past spring a trainer from EA’s Studeo 55 signed up 91 riders for Bike to Work Week, and with the help of EA’s leadership, amped up the bike friendly factor of their business by installing new racks and blasting internal communications about the event. A number of more experienced riders even offered to support new riders by coordinating orientation rides from various neighbourhoods across the surrounding cities. Their experience was blogged and tells the story. 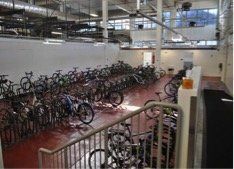 HUB was there to assist this organization through the process with communications and resources and EA was able to work on increasing its bike amenities as it has dedicated staff looking out for its employees’ wellness. At HUB we realize that not every business or organization has the same capacity or resources, however, we can help you gain the benefits of a wellness program that fits the needs of your team – helping you to build stronger community through support and encouragement of commuter cycling. Human Resource teams looking to engage employees and re-energize workplace wellness programs can subscribe to the Traction Toolkit, a two year subscription of services that builds employee confidence for safe and enjoyable cycling to work. Traction Toolkit clients also gain the added benefit of public recognition of their efforts via HUB’s various media channels and partners. Employers looking to ride the wave of demand and interest in cycling related events, programs and services are invited to give us a call. We love to help businesses gain traction with our services.